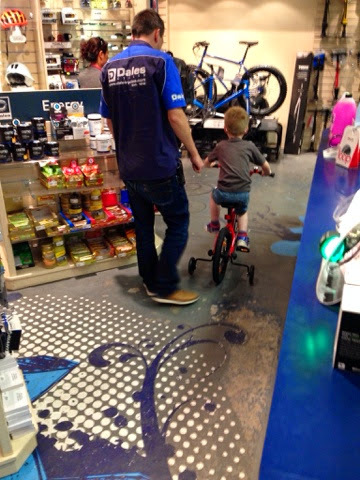 Dale's Cycles are Glasgow's oldest and largest local bike shop, and when we were asked to participate in a campaign to encourage kids cycling and learning to ride a bike, we jumped at the chance! 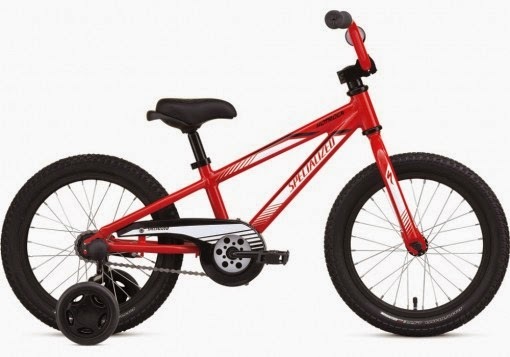 The eldest has a balance bike which is now a bit too small for him, and I felt he was ready to take the next step up to a bike with pedals. The store is massive and there is a huge selection of bikes. We arrived for our appointment with Chris on a Saturday lunchtime and the store was busy - lots of customers milling about and staff hard at work. 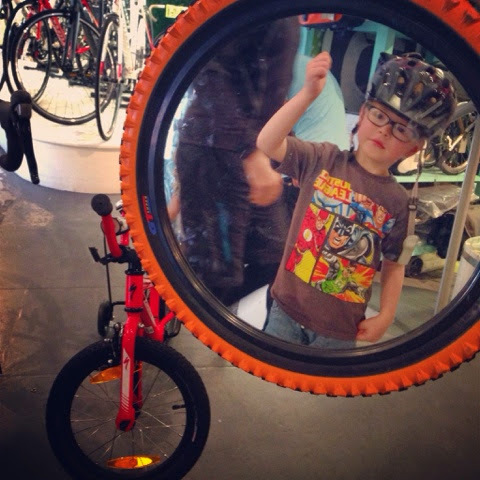 We didn't need to wait long to be seen though and a bike had already been looked out for us as I had previously been in touch with my son's age and height. 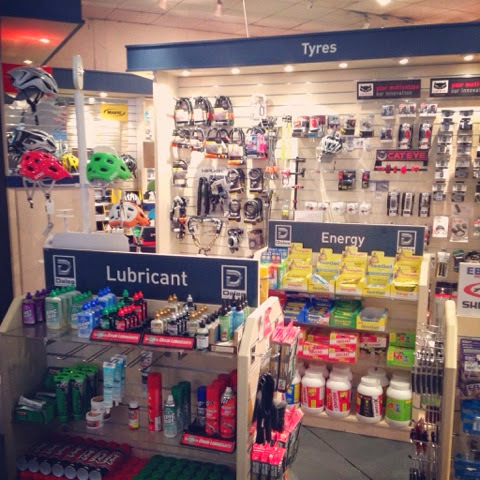 I'm such a child, but the lubricant and performance centre signs had me chuckling! Chris really knew his stuff and as a parent himself he was great at talking to my son and engaging him in the process. 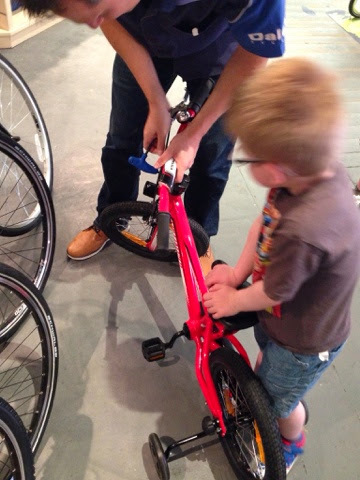 I have to admit I wasn't listening as intently as I could have been because the littlest was adamant that she wanted a bike too, but she wasn't getting one! A bit awkward, but I can only apologise to Dale's for her screaming throughout our visit!! I've been told it's not uncommon! 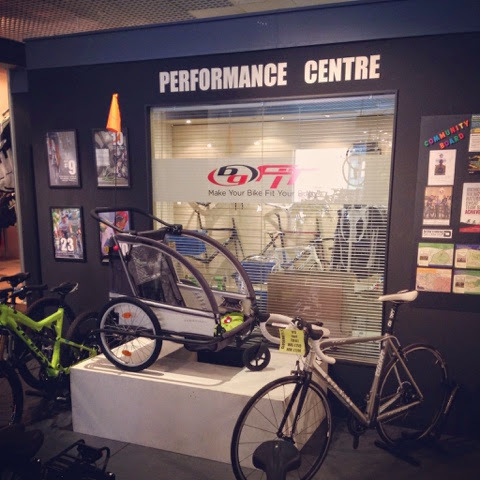 Test cycle through the shop! A few adjustments had to be made. Eldest watching intently!! We also required a new helmet as the one we previously had was getting a bit too tight. We bought one in red/black which matched the new bike! I was seriously impressed with the turnaround time and felt confident in Chris' knowledge and expertise. 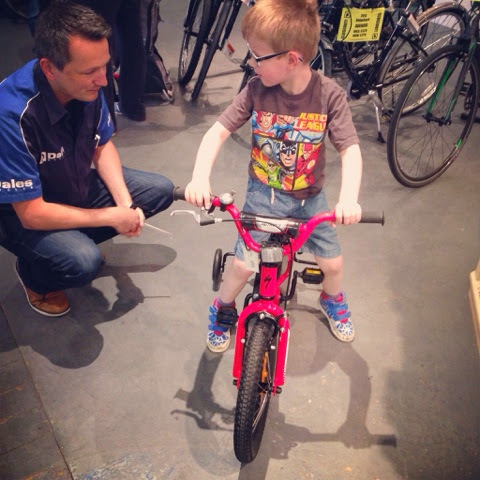 I would highly recommend you pay them a visit if you're looking to buy a bike, either for yourself or for your little ones. Dale's Cycles also participate in the Government's Cyclescheme which we felt was of interest. 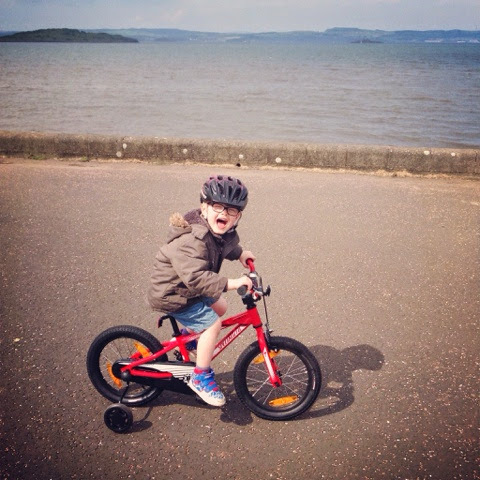 Next stop was Crammond to visit R's family and let my son have a shot on his new wheels. He absolutely loved it, but does needs practice. Concentrating hard on the pedals! I'll be back in a few weeks to update you on our efforts. 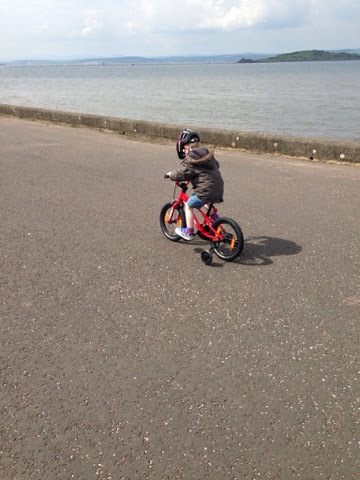 After our first week the eldest has been of the opinion that the pedal bike is too much like hard work and still wants to use his balance bike. I think it's time to remove the small bike from the house and force him to use the bigger one! He has been practicing in the new driveway which has been ideal for cycling/scooting and is starting to get better. We received a bike for the purpose of this review. Opinions as always are honest and are my own.